The annual musical festival in honor of late Fela Anikulapo Kuti, Felabration for 2015 begins on Monday October 12th 2015. This year’s edition has been tagged “Just Like That”. Some of Nigeria’s biggest artistes have been billed to perform this year and the time table looks like it will be yet another interesting edition. Some of the biggest artistes that will be performing this year include Olamide, Iyanya, Lil Kesh, Timaya, Modenine, Adekunle Gold, Chinko Ekun, Kayswitch, Ketchup, Vector, Solidstar, Remi Aluko, Oritsefemi, DJ Jimmy Jatt, YQ, Burna Boy, Kiss Daniel, Tekno, Olu Maintain, Small Doctor, CDQ, Naeto C amongst others. 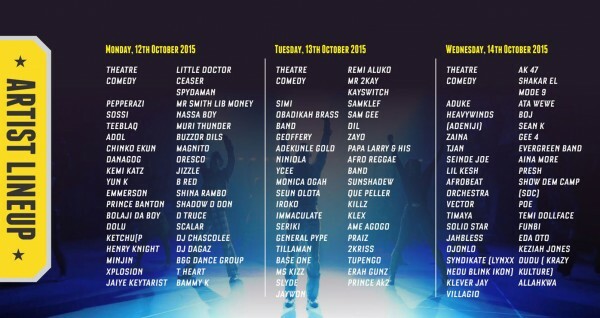 Felabration 2015 concerts hold from October 12th to 17th.